Dharamshala: - Around April 22, the students' textbooks and other reading matter were raid by Chinese authorities, and any books not endorsed by the government were confiscated and burned, according to a latest Tibet report. Students were warned that they are not allowed to possess any book without an official stamp of approval. The many students who come from Ngaba county were told that they may not return to their homes for an indefinite period, and would not be allowed to return there during the summer vacation. 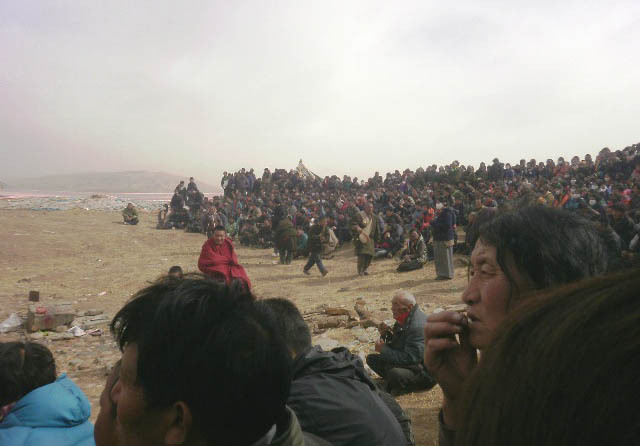 A latest report received by The Tibet Post International, it will be remembered that students of the Ngaba prefecture upper middle school (in Barkham) went on hunger strike from March 17 in sympathy with the suicide of Kirti monk Phuntsok and the situation of the Ngaba people, and in emphatic protest against the state's singular resort to deployment of police and armed troops to deal with the situation in Ngaba county, and the arrests and suppression of the population there. The students were then forcibly confined, had their mobile phones confiscated and internet access cut, and were forbidden from making outside contact. According to Ven Kanyak Tsering, one of the media coordinators of Dharamshala based Kirti monastery, on April 12, two of the elderly people who tried to oppose the soldiers at Kirti monastery were killed, and a group of younger people were detained. This group was taken to a detention centre where they were subjected to beatings and mistreatment. The other older people in that group were taken to a compound next to the Ngaba river where they are being put through a daily program of reeducation. On May 8th it was learned that Chogyam of the Chogyam Tsang house, age about 33, in the Chukle Gongma pastoral area of Ngaba disappeared around April 15. His mother's name is Manay. On about May3, personnel from the provincial State Security bureau in Chengdu and police came to search his mother's house, and his own house up in the pastoral area. At that time it became clear that he is being held in detention in Chengdu. He left behind his wife and one year old child. There are many similar cases of disappeared people who have been missing for very long periods, apparently being held by State Security and Public Security, about whom no information whatsoever can be found as to their whereabouts or circumstances. When the Kirti monk author Go Sherab was detained, for example, nothing more was known about him until he was eventually released. (Go Sherab was released in Chengdu on May 5. he is not permitted to return to Ngaba. The exact date of his detention is not known). Since April 18, older women (aged 50-60) with citizenship cards have been allowed to come and go from the monastery (e.g., to visit relatives), but on May 6 it was announced that visits would not be allowed more than once a week. Soldiers and police have been posted at the entrance to each monastic dormitory, and control tightened.